When I saw the cover of The Curious Case of the Clockwork Man, I couldn’t walk away without picking it up. I didn’t even bother to read what it was about. What was the point? The cover had a robot sword fighting some weird monster dude while ghosts flew around their heads. How could this book not be awesome? And for the most part I was right in judging this book by its cover. It is pretty awesome, full of adventure, steampunkery and general Victorian madness. What I didn’t know going in though was that this was the second in a series where the events of the first book had a very heavy handed influence on the outcome. This left me confused in many areas, especially at the beginning when character relationships are defined in half explanation only involving events that I would have known about had I read the first book in the series. Because I didn’t, it took some time for me to get into this otherwise ridiculously cool book. What I gathered is that the first book involved a time traveler who was attempting to divert some future catastrophe and ultimately change the destiny of the world completely. Our dashing protagonist, explorer Richard Francis Burton is one of a handful of people who realize all this crazy technology involving steam powered flying machines and trolleys made from the shells of genetically altered giant centipedes is not how the world was meant to be. But he can’t really do much about that now other than try to keep people from doing evil things. He is the king’s man after all. With his red-headed, drunken poet of a sidekick, Algernon Swinburne, Burton solves mysteries in a very Holmesian manner (and I mean the more classical Holmesian manner, not the Benedict Cumberbatch or Robert Downey Jr. way). When someone claiming to be a long missing member of the cursed Tichborne estate appears, Burton is tasked to identify the man’s real identity and prevent this man, who most believe must be an imposter, from taking over the estate. In the middle of this investigation, Burton and Swinburne get wrapped up in a much larger, more mystical mystery involving black diamonds that have strange effects on the mind and might be of alien nature. When mist-born apparitions begin appearing in the streets of London and the common class begin to riot against the more privileged, Burton and his mismatched crew of associates have to figure out how it all ties together before the rioters burn London to the ground. This book is crazy, twisting upon itself with one plot buried within another. There are adventurous chase scenes, many of which involve giant, genetically altered swans carrying passengers miles in the air while riding in cloth kites. There’s brain washing, ghosts, witches, more time travel and general chaos throughout most of the book. With a background of genetically modified creatures and advanced steam-powered technology, this is not your usual Victorian England. People drive the Folk’s Wagon – a carriage fashioned out of the hollowed out exoskeleton of genetically modified giant beetles. Messages are sent via the postal system – made up of a series of greyhound dogs that can never stop running – or via foul-mouthed parakeets who like to add in their own colorful embellishments. This book is insane, but all in a good way. Burton is a very straight laced protagonist, easily balanced out by the flighty poet Swinburne, who has a well-known predilection for paying prostitutes to beat him senseless. Then there’s the homeless philosopher Herbert Spencer, who can only philosophize when in a strange hypnotized state, and various members of Scotland Yard, who really have no idea what to do as their town falls under the seeming influence of ghosts and monsters. There were a couple of times when characters outside the main pairing would run together for me, but as the book went along, even the coppers received distinguishing characteristics to individualize them. Though my biggest complaint about The Curious Case of the Clockwork Man? Not enough robots. 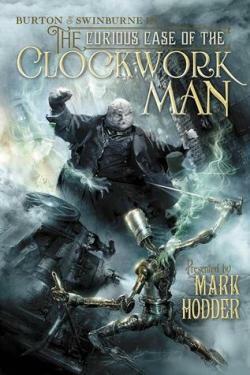 For a book with a robot reference in the title, the clockwork man doesn’t actually appear in much of the book. I suppose he’s around when it counts, but still, needs more robots. After reading this novel, I very much want to go back and fill in the blanks regarding the Spring Heeled Jack incident that makes up the preceding book. This is steampunk in its purest form, taking an alternate version of Victorian London and all the famous names that allows, and twisting them into an adventurous tale involving madmen, steampowered transportation and gadgets galore. The book ends with a glossary of the people involved in the story, saying what they were doing in the real Victorian England during the time period covered in the book, which I found incredibly fascinating. Even characters I’d previously thought to be fictitious to fit the plot were real people, and it’s fun to see how much Hodder implemented into his twisted version of reality. I’m looking forward to filling in the gaps of my Burton & Swinburne adventure knowledge and seeing what shenanigans lay in their future. I got a copy of this book from the library. They made me give it back. Blurb from GoodReads.